He remains one of Britain's greatest rock'n'roll stars. 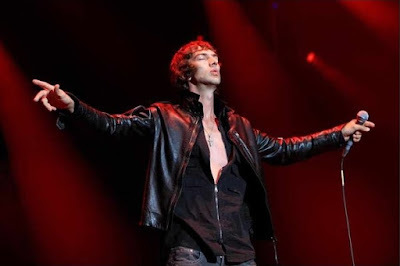 Call him what you will – Richard Ashcroft, the shaman, Mad Richard – he was the guy who wasn't supposed to survive Britpop. Too many drugs, too much hard living, a ceaseless observance of wild times, the Hedonist In Chief could have checked out long ago. "I feel lucky I got out alive," he says. "People wanted me to become this clichéd Keith Richards, Iggy Pop character. I wasn't expected to marry a beautiful wife and have kids." And yet that's precisely what he did. After forming The Verve with guitarist Nick McCabe, bassist Simon Jones and drummer Peter Salisbury, he created the megalithic Urban Hymns. It spawned "The Drugs Don't Work," "Bitter Sweet Symphony" and "Lucky Man" as it won a BRIT Award and sold more than 10 million copies, becoming the 18th best-selling album in UK chart history. The band crashed and burned. There were fall-outs and bust-ups, breakdowns and dust-ups. And Richard, described by Coldplay's Chris Martin as being 'the best singer in the world', went his own way. His debut solo album, Alone with Everybody, was a number one while his next two albums achieved gold and platinum discs. And while the underwhelming 2010 album United Nations of Sound stalled, he roared back in May last year with a fifth album, the storming These People. It matched the bombast of his best work, mixing soulful balladeering with epic rock tunes. He has no regrets about taking such a long time out. He lost two close friends, his guitar tech, Rex, and manager, Jazz Summers, and felt no need to put out a record while they were dying. The passage of time, however, led him back to the studio and Richard will bring These People, songs from his solo albums and classic Verve tracks to Birmingham next week. He's on the road with four arena dates, including the Barclaycard Arena on Thursday. It's time to celebrate, to tap into the joyousness of live music. Richard's proud of These People. It was no small achievement to return to former glories after so long away. After all, he has had a longer climb back up the mountain than most. "In a way, I've made records in an old school sense where I write album for other people. There's a unifying soul to it, a unifying line." These People kicked off with "Out Of My Body," a plush, electro-pop groover that fused disco and house and talked about being out of it, without actually doing it. "I started that tune before Daft Punk did Get Lucky with Pharrell. I was working on that quite a while back, then Daft Punk did that sort of house-Chic thing. I remember thinking 'I've already done that'. I was working with this French electro guy and he sent me the Johnny Cash bit." Richard was keen to break down preconceptions and do something new. He wanted to challenge people expecting a solo version of Urban Hymns. And he succeeded. "I don't want to be put in with that rock'n'roll genre. It's so diluted. So is punk. They're all the same thing. I'm on my own creative journey to get past pastiche or parody or regurgitation. The gig as well as the album has to be something that goes beyond that." Richard has little time for the staid mediocrity of the charts. And he has even less for the chuggers on talent shows such as The X Factor, The Voice and Britain's Got Talent. "I can't believe how many of those shows are still on. As a country we're just getting sick of that mediocrity. If you have raw talent, you will rise at some point. I think that's the thing. I just wanted to echo a bit of my own story on the new record. We all have our own internal daily battles and the music reflects those." When Richard became one of Britain's biggest rock stars, he seemed to speak for everyman. His lyrics resonated with the downtrodded and overlooked. Was there ever a song that resonated more with office workers and factory men than "Bittersweet Symphony"? 'Trying to make ends meet, you're a slave to the money then you die'. He's still writing to the masses. He's ever conscious of the new political climate in which we're living and the way that shapes lives. "We're heading into a period where it's all about divide and conquer. We're going to be chopped up into groups. We're losing our humanity. That's why I'm wearing a gasmask on the front of the record. "The charts are dominated by music that opiates that condition. So, yes, the ideas go back to the ideas of 'The Drugs Don't Work' and 'Bittersweet Symphony.' For me, it's all about putting a mirror to it. You know: What am I going through? Do you feel like this?" Richard asks such questions. His audience invariably replies: 'yes'. "These days, people tie themselves to political masts that are so one-sided." And so he tries to go beyond the norm. He tries to break free of the ties that bind, of the formulas that fill the charts. "There are so many musicians who alienate people. Really what we're looking for is entertainment and art and culture that goes beyond the normal paradigm. "It shouldn't be tied to one side of a fence. People are looking for something beyond." He remains one of Britain's best frontmen. He's the man who implores his audience to 'c'mon' whether he's singing to 60,000 fans at Glastonbury or a few hundred at a club show. He's the wired spaceman whirling round in his own orbit, throwing sparks into the crowd. "Music is so important. When people go to a gig, they want more. You look at various cities in the world – such as Glasgow – and there are Sectarian divides in a single city. And you take sport, and what that does is highlight the rivalries instead of bringing people together. "Music is really the last thing that you can go to where something done by another human being connects with you. People come in to a show and leave their worries at the door. Everything else somehow turns into a political rally. That's what Glastonbury has become. It's like a political wake. "You'd go to that festival and it was all about a guy walking through the crowd selling cider – that would be the only refreshment you can get. These days, that's changed." Richard loves gigs as events. He gets tired of fans who watch the show through the viewfinder of their iPhone. He grows equally tired of other performers who use technology to gain an advantage. For him, it's all about the connection between performer and audience, it's all about that shared emotional journey. "There's so much documentation of live music. There's different camera angles and everything's in HD. That almost shatters the illusion and the joy of the gig. I don't want to see up Bono's leg. Do you know what I mean? Because that doesn't capture the thrill of a great gig. "You know, live music has changed and I think we'll reach a bursting point with summer festivals. But I wish everyone well who goes to them." When Richard wrote Urban Hymns, he had little idea how well it would connect. He wasn't thinking about writing tunes for millions or creating melodies that would fill arenas. He was simply trying to articulate his inner monologue. He was trying to communicate the happiness and pain, the joy and sorrow of the human condition. "One thing that's different about someone like Noel (Gallagher) or Thom Yorke is this: When people were listening to Radiohead or Oasis or The Verve, they were listening to songs that we wrote because that's what we were into. And I think that's why we connected. I think that's why so many people connected with those songs. "But what you have now is people writing songs for a particular environment. You'll get someone writing something because they think it will sound great in a stadium. I didn't write songs thinking: 'When I'm in Leeds, this will sound great'. But I think that's what's worrying now. I think those sorts of bands are almost taking over. "With music and doing great gigs, it's never an ego thing for me. It's more about great events. These big gatherings of people are important. "I remember seeing Oasis when they started kicking off and nobody else had done that. Those big guitars, that music filling big arenas – no other band was doing that, nobody was amplified to that same scale. "I don't know what's coming next, so I like to treat every event like 'this is it'. People think that's unrealistic. But I've always felt like that. it doesn't matter what the gig, where you are. You owe it to yourself. I remember when I started going to gigs and I had hopes and aspirations that it would transcend my life. And that's why I try to do. I like those nights when the band's on fire. I want to set a new bar." Though Richard will forever be associated with The Verve, he's been quite happy to plough his own furrow since the band split up again in 2008, following Forth. That was the third time they'd broken up and he doesn't imagine they'll play together again anytime soon--if at all. "I don't see anything in the foreseeable future. The last time we were back was to create new music, which was really important."